Along our coastline something quite amazing happens once a year — sea turtle nesting season! Between May and September these beautiful creatures will come onshore to bury their eggs in the sand before returning to the ocean. In our area many of those turtles are loggerheads which grow to be massive size of up to 300 lbs. According to FollyTurtles.com it is believed that female turtles will return to the beach that they were born on to lay their eggs. How beautiful is that? Folly gals! Such a tiny fraction of these beautiful creatures will survive to reproduce….but YOU have the power to help. Remember to turn lights out on the beach at night because sea nesting sea turtles can find themselves confused thinking that your lights are the moon. Fill in any holes and knock down sand castles at the end of the day as these could slow the baby sea turtles down on an already perilous journey to the sea. Also remember to clean up your trash when you leave the beach — better yet, don’t bring it to begin with. Things like cellophane wrappers and those plastic straw covers on kids’ boxed juice drinks look just like one of the sea turtle’s favorite snacks — jellyfish! 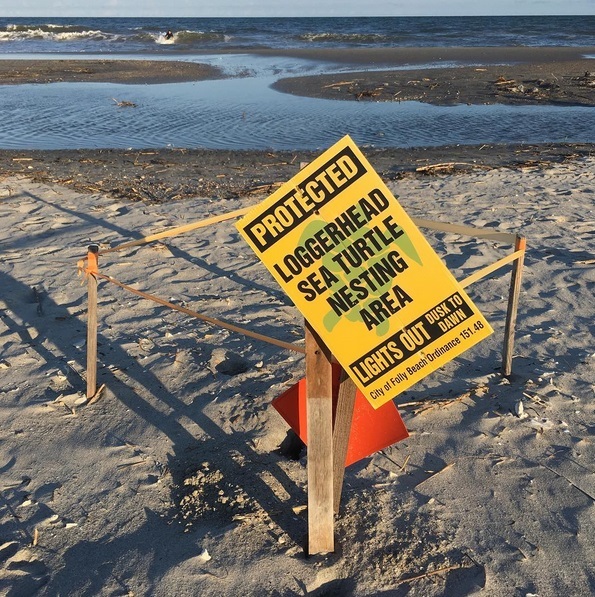 Want to know more about the Folly Beach sea turtle population? Check out the Folly Beach Turtle Watch Program’s Facebook page.